A fascination with the way things are put together, a pharmacy degree and inspiring leadership in pharmaceutics led me to a career in formulation. There are some amazing materials available to use in formulations, both synthetic and natural. The diverse functionality of natural ingredients, especially polymers, is stunning. That functionality can be physical functionality as seen in the formation and strength of spider’s webs; stalks to hold up the fronds of seaweed to allow them to capture the sun’s energy or actual biological action such as the healing properties of hyaluronic acid. How do we formulate these materials to exploit these functional properties? There are so many exciting challenges and opportunities like these. It’s up to formulators to take these materials and use these to support the generation of ideas and innovative products and then work out how best to turn them into products that can be successfully realised commercially. An understanding of particle and materials properties is essential for a formulation. I discovered what strange materials powders were during my PhD and this has haunted me since. For instance, at breakfast time there is muesli; how unfair it is that my wife pours out a bowl of fruit and nuts but the bowl I pour for myself consists mainly of boring oat and wheat flakes! Of course this is due to segregation and separation during product mixing, storage and pouring. This behaviour is typical of many things that we formulate. For example, if we make a powder product for treating colds that has to be reconstituted in hot water, how would it be if some of the sachets get all the drug while other sachets contain little drug and mainly fillers? Segregation in bulk powders and other collections of particulates can be assessed at the early stages of formulation design and segregation behaviour is an important parameter when justifying the choice of a specific grade of an ingredient. Often visual inspection (as in the case of my muesli) will if tell you if gross segregation is occurring at the early stages of formulation design. Eventually an analytical evaluation is required to detect the fine detail of the extent of segregation or if particles of different composition cannot be readily distinguished . This is especially true for critical products such as medicines. If you haven’t tried it, you may find that the sampling of powders is fraught with difficulties. Just putting a scoop into the powder bed will induce differential flow of particles and the development of slip planes which can cause segregation at the sample point and result in a non-representative sample. For an illustration we can go back to my breakfast – if I put a spoon into a tilted box of muesli I will find it filling up with larger particles which have a higher propensity to roll – hazel nuts being an obvious example. Today more in-situ analytical techniques may be used to remove the need for sampling but it is still important to ensure that the detection point does not induce segregation. So, how do you prevent segregation? Careful selection of material grades so that the physical properties of particles of the different components match each other as far as possible can reduce the propensity to segregate. In this case the particle size, the shape and the density are typical parameters to be assessed. These can be tricky to determine, for instance in the case of particle size what is the diameter of an irregularly shaped particle? In the case of shape, what shape factor should be used? How can you change density – perhaps by changing the particle porosity? Should you also consider differences in the surface frictional properties, surface charge and surface moisture. The most robust formulations are the ones that stay homogeneous through processing, dosing into consumer units, storage, transport and consumer use. So we do the best with the materials we have and if we need to we can use process techniques such as agglomeration or milling to achieve a more uniform size and shape. 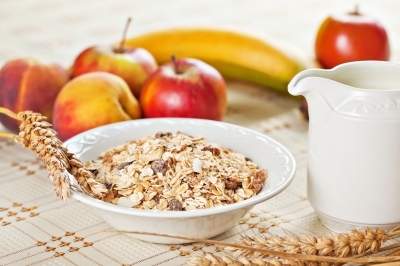 One popular manufacturer of muesli seems to adopt the latter approach has milled up of all the components together. So I guess that consumers consider the benefit of having a consistent mixture of ingredients throughout the packet is more important that experiencing the varied texture of conventional muesli, the composition of which may vary between the bowls of different members of the family!